Looking identical to its turbo-4 brother, the Alfa Romeo Giulia Quadrifoglio has a Formula 1-inspired twin-turbo V6. As a responsible automotive journalist, it’s been my long-standing motto to avoid losing it and gushing too favorably about any car. 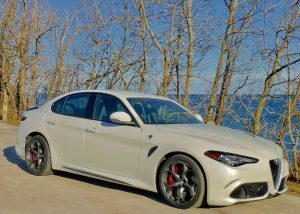 And, in looking back a month or two, I must take full responsibility for losing it when I reviewed the Alfa Romeo Giulia TI, with its great balance and handling and its potent 2.0-liter 4-cylinder engine. Bear with me, because it’s that time again. After just enough time between driving the bright red Giulia TI and the hard-core onset of winter, I got the chance to spend a week with a flistening Trofeo White Tri-coat Alfa Romeo Giulia Quadrifoglio. If the 2.0 Giulia is the perfect sedan, then the Quadrifoglio is its muscular big brother. Reports are that parent Fiat instructed subsidiary Ferrari to assign its best Formula 1 engineers to build the hot little four, and they did well. Those engineers must have enjoyed coming to work every day to work on the Quadrifoglio, however, because they overachieved. 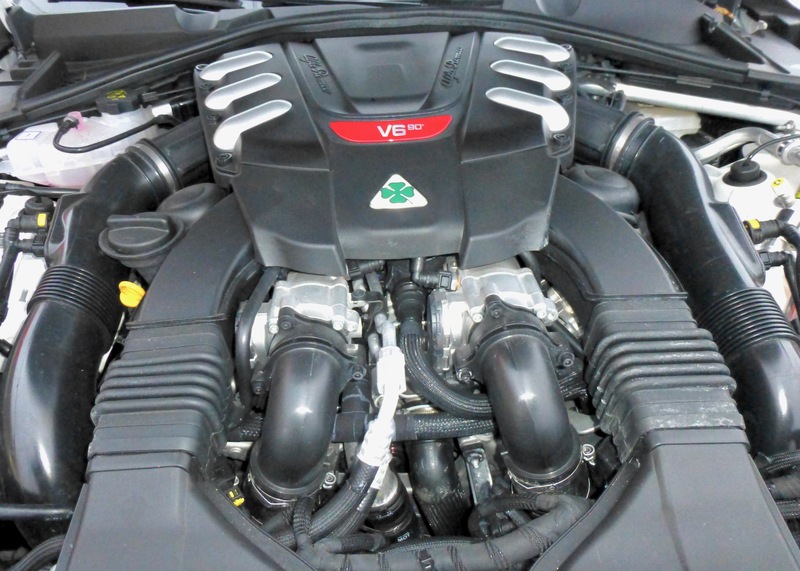 They were told to build engines that could make the new Giulia something truly special, and they came up with a 2.9-liter V6 — not very big, by V6 standards — and they forced power into it with twin turbochargers that resulted in 505 horsepower and 443 foot-pounds of torque. Driven through an 8-speed automatic transmission, with those giant paddles affixed to either side of the steering column, you need to be especially alert behind the wheel, because the Quadrifoglio could get away from you. The four had a remarkable 276 horses and 295 foot-pounds of torque, and while that is far more than adequate, numbers like 505 and 443 allow the Quadrifoglio to rise to a whole ‘nother universe in scorching car performance. 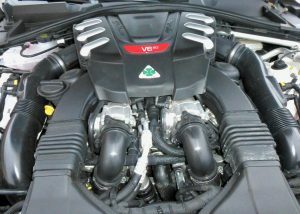 Twin-turbochargers extract 505 horsepoweer and 443 foot-pounds of torque from Giulia’s 2.9-liter V6. Various tests have shown the 4 to go 0-60 in less than 6 seconds; the V6 Quadrifoglio does it in 3.7 seconds. That is elite, exotic sports car territory, and this from a 4-door sedan with a real, usable back seat and trunk. There is a similar little knob on the console where the shifter is mounted that is similar to the normal, sport, and race positions, and it is for track. That’s right, in case you find a race track worthy of your time and money to run the hotter Giulia up to its formidible limtis, you can set the suspension and transmission and steering and exhaust for all-out track-style performance. 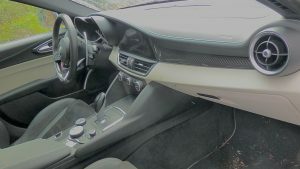 For normal driving, if there is such a thing in such a car, the normal setting is sporty enough and performs well enough. Race upgrades it all, and track puts it away. There is no angle that the Giulia doesn’t offer a compelling view. The most impressive feature of putting the Qluadrifoglio into race or track settings is the absolutely exhilarating sound that bellows out of those quad exhaust tubes and resonates through the body of the Giulia and also through every fiber of your body. And soul. It gives me a thrill all over again just describing it. The car’s handling is near-perfect. 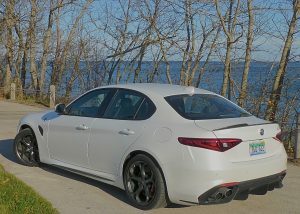 I know, I know, I said the Giulia 2.0 was as near perfect as possible, and the best-handling car I had ever driven. I would not say the Quadrifoglio handles better, because all that extra power, in a rear-wheel-drive car, can make you immediately and constantly aware that you are always on the ragged edge of breaking away from the rear tires’ grip on the surface. That may mean the 2.0 Giulia TI is better at real-world handling, but the Quadrifoglio is the clear choice for drivers who want their abilities and concentration to be challenged every time they strap themselves into the racing bucket seat behind the steering wheel. We are still awaiting the introduction of the Giulia with either engine and the added attraction of all-wheel drive. It’s coming, we’re told. So is Christmas, we would reply, if we used that sort of cliche. Gleaming pearlescent white paint is almost as distinctive as the Giulia’s signature red. Both Giulias look alike, except for the large 4-leaf clover emblazoned on either side of the Quadrifoglio. That word, incidentally, means 4-leaf clover, which is Alfa’s signature logo. 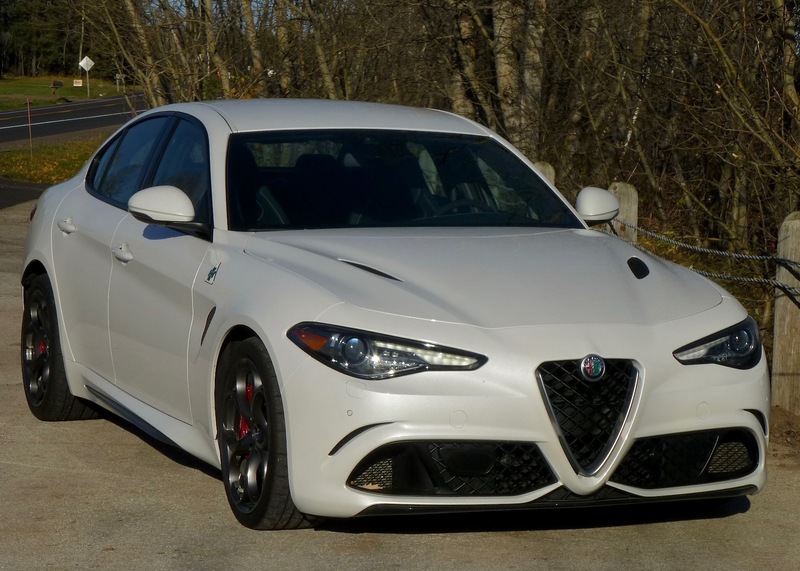 Maybe it means you will have good luck if you drive one; more likely is that Alfa designers, engineers, and aficionados, are all fully aware that you are indeed lucky if you possess a new Giulia. It takes a little cash to own one, incidentally. 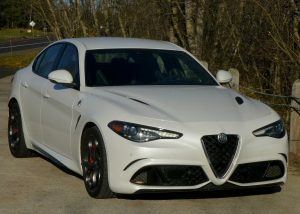 While the 2.0 can be bought for something in the $40,000 range, it will take about twice that much to buy a Quadrifoglio. The base price on my test car was $72,000, and the list total, after all the options, was $89,845. That gets you the beautiful exterior, the Formula 1 designed V6 engine, either the 8-speed automatic or a 6-speed manual shifter, and all the standard Giulia Quadrifoglio features. That list includes torque-vectoring differential, active suspension, a carbon-fiber driveshaft, rear parking, back-up, cross-traffic and blind spot alerts, auto-dimming lights controlled by infrared sensors in the windshield, remote start, rain-sensitive wipers, and stop-start. Inside, you get genuine leather and carbon-fiber accents, power seats, Pirelli performance tires on special 19-inch alloy wheels, carbon-fiber roof and hood, bi-Xenon lights and LED accent lights, the best ceramic Brembo brakes — which really stop the car instantly — adaptive cruise, lane-departure warning, and a Harmon Kardon premium sound system. Sweeping simplicity of dashboard, center control console and instruments let you focus on driving. If there ever was something superfluous on the Giulia Quadrifoglio, it might be the exquisite sound system — simply because a lot of folks might prefer to click it to race and let the engine rev and the sound reverberate off the inside of your cranium. At the price of the Quadrifoglio, you are in range of some fine, exotic cars, including Porsches, BMW, Audi, the top Corvettes, Jaguars, Maseratis and other names that make you stop and pay attention. In that company, I’ll take the Alfa Romeo Giulia Quadrifoglio. But if I had to pay for it, I’d instead buy his and hers Giulia TIs with all-wheel drive. Then my wife, Joan, wouldn’t always be asking me for the keys to my car.